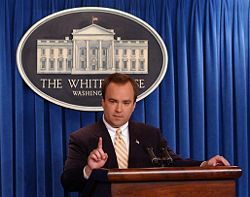 Stewart Howe and Jeremy Rothe-Kushel ask Whitehouse Press Secretary Scott McClellan about 9-11 and the Constitution. McClellan pretends to not have heard of PNAC and Building 7. Unfortunately for McClellan, treason is not that easy to hide from. Video footage shot by Jeremy Rothe-Kushel and Stewart Howe. Editing by Joel Bevaqua. Ask Scott McClellan critical 9/11 Questions on his Book Tour! Hear his House Hearing testimony on No Lies Radio. House Judiciary Hearing with former White House Press Secretary McClellan. He was with the White House on 9/11 and could know more than he is telling right now! Listen to his testimony. Prepare well. Then ask him critical 9/11 questions on his upcoming Book Tour! Like when did Cheney enter the bunker? Source: Air America Newsletter received via email today. ("The way to deter the 'culture of deception' in McClellan's subtitle is a combination of voters, lawyers, prosecutors and a Truth Commission -- to vote against it, sue it, prosecute it, or expose it . . . . "
Scott McClellan's book What Happened has been a feast for cable talk shows and commentators everywhere, with much discussion veering off on his motives. The Bush Team went into overdrive with its smear gear. Disgruntled? Money grubbing? Out of the loop? Off his rocker? A Manchurian author controlled by his North-Korean-like publisher? In a laughable attempt to blame the radar gun for the speeder, apologists Michele Bernard and Michael Smerconish actually argued on MSNBC that the big story was whether McClellan wrote the book in order to defeat McCain. They say that every president gets the psychoanalyst he deserves. And every Hamlet gets his Rosencrantz. So now comes Scott McClellan, once the most loyal of the Texas Bushies, to reveal “What Happened,” as the title of his book promises, to turn W. from a genial, humble, bipartisan good ol’ boy to a delusional, disconnected, arrogant, ideological flop. Although his analytical skills are extremely limited, the former White House press secretary — Secret Service code name Matrix — takes a stab at illuminating Junior’s bumpy and improbable boomerang journey from family black sheep and famous screw-up back to family black sheep and famous screw-up. How did W. start out wanting to restore honor and dignity to the White House and end up scraping all the honor and dignity off the White House? It turns out that our president is a one-man refutation of Malcolm Gladwell’s best seller “Blink,” about the value of trusting your gut. Every gut instinct he had was wildly off the mark and hideously damaging to all concerned. Editor’s Note: Scott McClellan’s new book may be welcome in that it corroborates many claims from George W. Bush’s critics. But it’s still galling that so many prominent journalists who bowed before Bush’s bullying in 2002-03 have only seen their careers flourish. Bush Sought ‘Way’ To Invade Iraq? This story (and Scott McClellan's book) should make our jobs a little easier . . . I wonder how many Americans will still believe that McClellan et al. didn't REALLY know what was going down in the White House? McClellan's fooling himself (as) much the same way as Bush does (believes his own spin and propaganda) if he wants the reader to believe that "he and his subordinates were not 'employing out-and-out deception' to make their case for war in 2002". The GWBush Administration will be remembered in history as a particular time when integrity and character were MIA in the extreme (and perhaps this will help reveal the truth behind 9/11) . . . . As one bumper sticker reads, "At least Nixon had the decency to resign." Will anyone connected to the GWBush White House ever stand up and do the right thing? http://www.youtube.com/watch?v=MInBl9ZB37Y&feature=related(Dave Matthews Band w/ Robert Randolph "Stand Up"